Nerve pain is dark. It encompasses one’s every thought. Leading up to and during the recovery of my back surgeries, the pain was ‘out in front of my thinking.’ What I mean by this is that there was rarely a moment that the pain did not consume my every waking moment or steal my sleep. There was never any position of comfort; no escaping its blowtorch agony. On three horrific occasions, the pain reached a level that it felt as though my sciatic nerve tore from my spinal cord, in a way resembling someone sawing off my leg. I only wish that I were exaggerating. During each of those episodes, which lasted several hours, I felt certain that I would not survive. Yet, in the midst of these unexplainable pain events, God’s presence was stronger than I had ever known possible. During one of them, the enemy devised a cruel plot to convince me that a loving God would not put one of His children through such pain. In my weakest moment, he tempted me to question my salvation. Frail from suffering, I almost yielded to Satan’s lie, but not without much emotional distress. Crying out to God, I told Him that if the enemy were right, that I had never known salvation, then I would rather not live anyway. Although my physical pain was immense, the devil’s hurtful lie was more so. What he did not realize was that his deceitful attempt to harm, God used for good. When faced with even a remote possibility that my faith was not real, I knew with certainty that if not a child of God’s, life had no meaning at all. In that cruel moment, when scraped to the core physically and emotionally, I discovered that God meant more to me than anything, even life itself. I remember so vividly the tenderness with which God reached out to me right then. The certainty of His love for me washed over me, as gently as a stream pours over polished stones. I may not understand the why of my suffering, but I will never again allow the enemy to tempt me as to whether I belong to God. After the surgeries, progression with my lower back was slow, but steady. Thankfully, the sciatic pain, which had been at the front of my thinking, is most of the time so far to the back that there are times where I must pause to check that it is even still there. 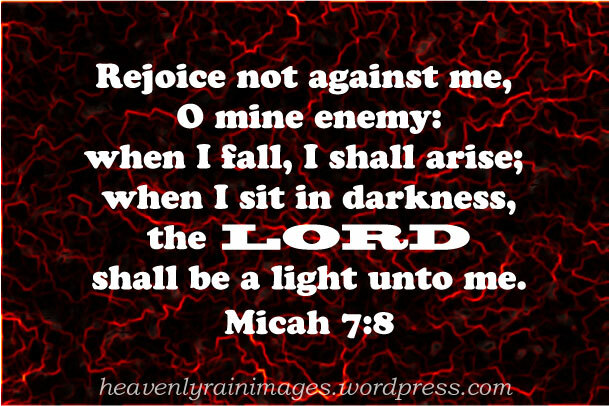 The intense darkness of pain now replaced with God’s healing light. God is good! Although I will never return to those earlier strong years, and must now use judgment with physical activities, I am able to work again as a nurse and can zoom on my treadmill. To finish the discussion of my physical pain journey, I will share next about lessons that I learned, and of how God is sustaining my health, despite problems now with my neck. It is a story of how He continues getting me through. Bear with me, my wonderful readers. I promise tomorrow’s post is uplifting and not all this dreariness! *I know that many of you have had or are currently enduring pain. I would love to hear your story, too, so that we can support each other. This entry was posted in A Painful Saga and tagged God, healing, pain, Satan, Sciatic nerve, temptation on September 4, 2013 by heavenlyraindrops. Sue, what a powerful and inspiring story of God’s love. It is amazing how our fears and doubts fade away instantly in light of God’s amazing love. Hope you have a great day! Sis, I am truly impressed and moved read your story. awesome depiction about God’s love. Once again I learn something precious from your story. Many love and blessing to you,sis. You, too, Karina. Blessings back. Inspired by your story (as Im currently fighting quite a bit of joint pain due to the recent humidity), and praying for complete restoration to every cell in your body. Be well, my friend! I pray the same for you. Thanks so much. Dear sister, what’s “dreary” about finding out that you loved God more than life itself? I know something of back pain, having felt a disc tear when I bent over to pick up a carton I was delivering. God used a spinal laminectomy to heal me, and I pray that He will completely restore you. I marvel at nurses, anyway. 12 hour shifts and patients…. What angels you all are! Thanks so much. What I have discovered is that no two back patients are the same. We are all on a journey yet God meets each of us right where we are. Will pray that you never again face back issues. Thanks so much for your kind feedback. Sue: What faith through the darkest hours of your healing process! What a testimony of casting all your cares on the Lord, and watching how He cared for you! Thank you for sharing this amazing journey with us. Bless you! Dreariness? I found your post to be uplifting, despite the deep sorrow over knowing the intensity of the pain you experienced. I think if a believer has not yet experienced a crisis of belief, it is coming, and I pray that anyone who reads your story and later faces that crisis themselves, they will recall your testimony of God’s tender mercies. Looking forward to hearing the best part! Thank you for sharing out of your pain. God is too wonderful for words. How He works good in and through our sufferings boggles my mind! All we can do is love, praise and give thanks. Oh Sue, how precious you are! Sue, you’ve been through such a trying time, and I rejoice with you that through it all, by God’s grace you came out victorious! Your testimony of perseverance through pain speaks to us all. God’s presence with us even in the darkest of hours is so powerful. I am so glad, Sue, that your story has a happy ending. Pain has a way of moving into our heart and mind. Your story will encourage others to not listen to the lies of the enemy. Amen, Wendy. I pray that others are encouraged by my sharing. Blessings your way. Thank you so much for sharing! I so appreciate you always pointing us to the Lord. He is our only Hope. Your story is a powerful testimony to His constant present in the life of His child. I did not find it “dreary” at all, but found comfort and hope in it! Blessings, Sue, as you continue to share what He puts on your heart! Thanks, Heidi. I guess we don’t always come across as we see things. Very glad it was not dreary, but rather a blessing. I’m trying to catch up on my blog reading and I’m reading your blogs backwards, so please excuse me if my comments get out of order. Sometimes I get frustrated with myself when I fall for one of the enemy’s dirty tricks like attacking me when I am most vulnerable. It seems that’s when our Loving God shows up, like He did for you. Remember the battle is already won. I pray for you to have some peace and comfort. God has done amazing things through all this. He continues to be the lifter if my head!